The Robinson Annulation is a method for forming the six-membered ring. It is a sequential combination of the Michael addition and the intramolecular aldol condensation. The Robinson annulation is a ring-forming reaction that combines a Michel reaction (1,4-addition) with an intramolecular aldol reaction. The product to be obtained is α,β-unsaturated ketone in a cyclohexane ring that contains three new carbon-carbon bonds (two σ bonds and one π bond). PART 1. 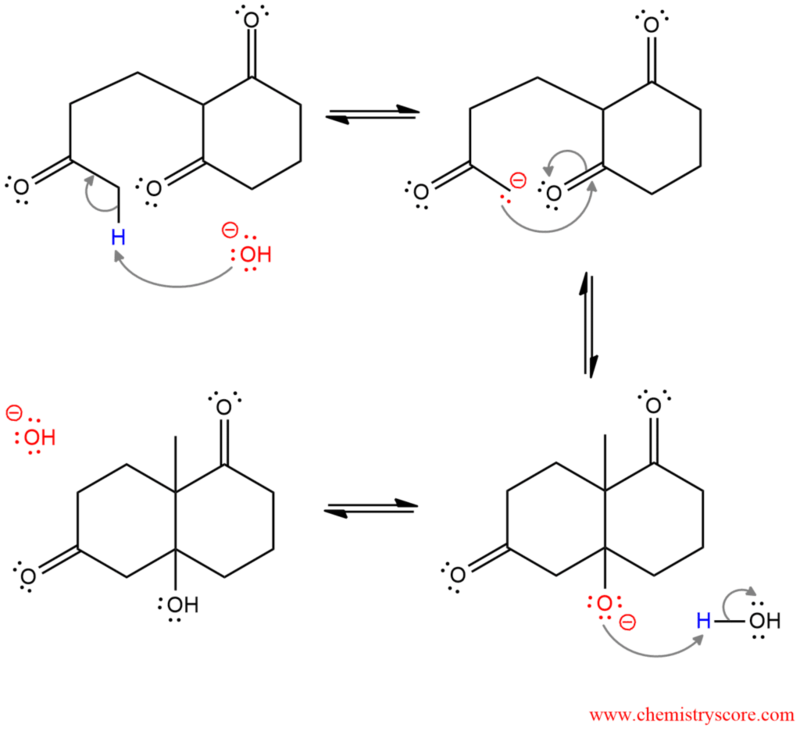 This is the three-step mechanism for the Michel addition that forms the first C-C σ bond. 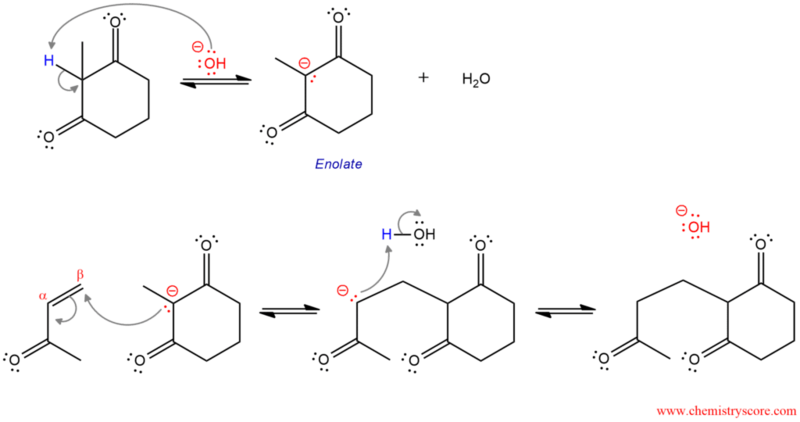 The first step in this part is a removal of the most acidic proton to form an enolate (this is resonance-stabilized enolate but not all resonant structures are shown because in this reaction it is not very important). In the second step, this enolate function as a nucleophile and attacks the β carbon of the α,β-unsaturated carbonyl compound. This forms a new carbon-carbon bond and an enolate which is stabilized by resonance (only one resonant structure is shown). Protonation of the enolate forms an intermediate which participates in the next part of the mechanism. PART 2. This is the intramolecular aldol reaction in which the six-membered ring is formed. First, the enolate is formed by deprotonation. Then, the nucleophilic intramolecular attack forms another carbon-carbon σ bond and a β-hydroxy carbonyl compound is formed by protonation. The mechanism ends with dehydration which consists of two steps: deprotonation by hydroxide and loss of the hydroxide to the formation of new π bond in the α,β-unsaturated ketone.